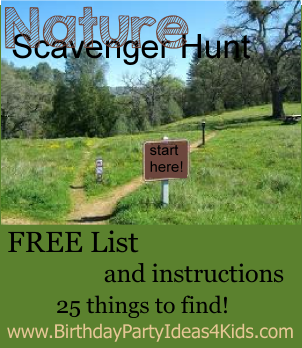 A fun scavenger hunt for outdoors! This is great game to play at a lake, pond, park or backyard. Take care of any hazards or dangers like fire ants, poisonous plants, spiders, dangerous terrain, etc. before the party. Each child is given a big gallon plastic baggie, a bucket and a spoon to help them collect their items. More Scavenger Hunt Lists for Neighborhood Scavenger Hunts, Holiday Scavenger Hunts and more! Complete rules, instructions and free lists for each hunt!